Don't tamper with the site's navigation or game components. Please do not use the CSS functions to: change the game information shown on your profile or villager's profile, overlay a fake image over your villager as if a Paintie were accepted with that image, hide or obscure game info or text or otherwise make the page unduly difficult to navigate. The latter includes but is not limited to, upside down text, quickly spinning or bouncing images, backgrounds that are too similar to the text colour, and animated or high-contrast backgrounds. Note: Failure to follow these rules may result in your profile CSS being removed, modified, or disabled. This post was made to clarify what "The latter includes but is not limited to" is referring to. These answers were compiled by users asking questions about specific parts of the layout. 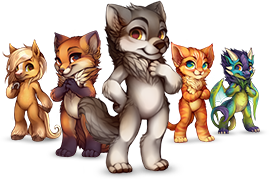 The Furvilla logo image in the header only can be edited or changed completely, as long as there is some kind of image there and the link remains functional. A blank space is not allowed. The Furvilla logo image can be changed into an animated gif as long as it is following every other rule and is not high-contrast. It can be animated with a CSS animation but only with a hover. Icons can be resized, or animated subtly or slowly with a hover, but not changed or manipulated to show a different image. For rotations, the fastest we will allow is one complete rotation per second. You are more than welcome to hide or change this image which appears behind the paintie/villager image. You cannot animate it in any way (CSS animations or gif). Cannot be hidden using CSS as they are considered a part of gameplay, however you may hide them using the checkbox is "Edit Profile"
Any CSS animation that is allowed needs to use a hover to be activated. The only exception to this rule is the village shield on your profile that can use a CSS animation without a hover as long as it follows our other rules.